We were so incredibly lucky to have this amazing young woman from Japan stay with our family for three weeks. Her name is Rina, she's 15, and she came to Utah as a foreign exchange student with a big group of classmates from her school. She is such a sweet heart and we loved every single second of having her with us. We turned one of our spare bedrooms in our basement into a little room for Rina to stay in. Before she came the room was completely empty, so we had to scrounge together some furniture for her to use. 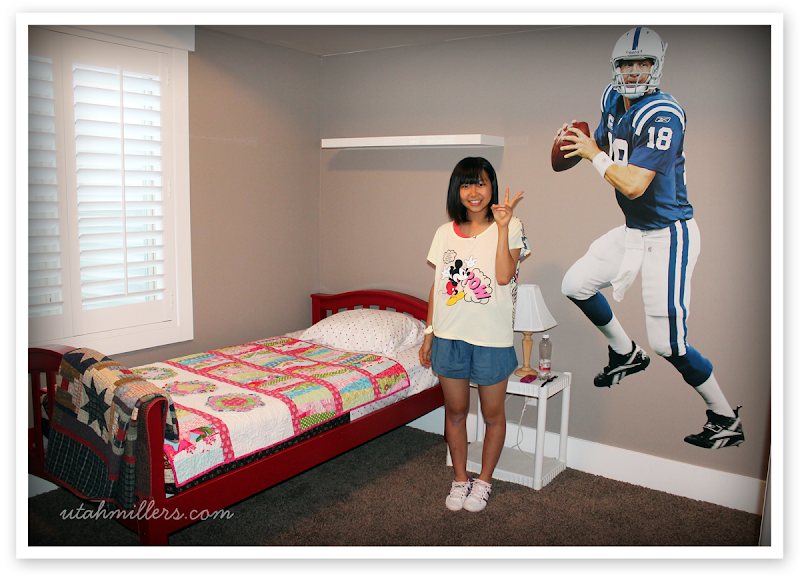 The previous owners of our home put up the wall decal of Peyton Manning and Rina got a kick out of having such a hunk of a man there to watch over her as she slept each night. 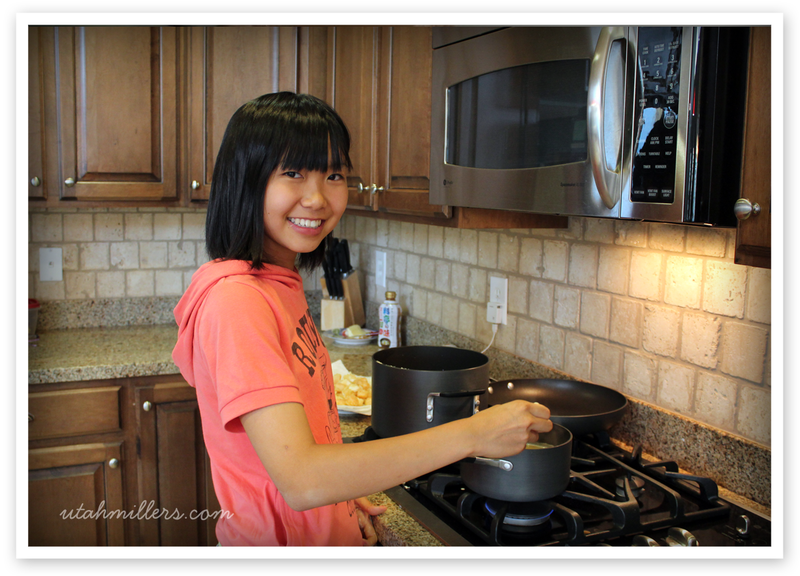 They try to pair the host families up with students with the same interests, so I was excited to get Rina because she plays the piano, loves to cook, and loves the outdoors just like I do! 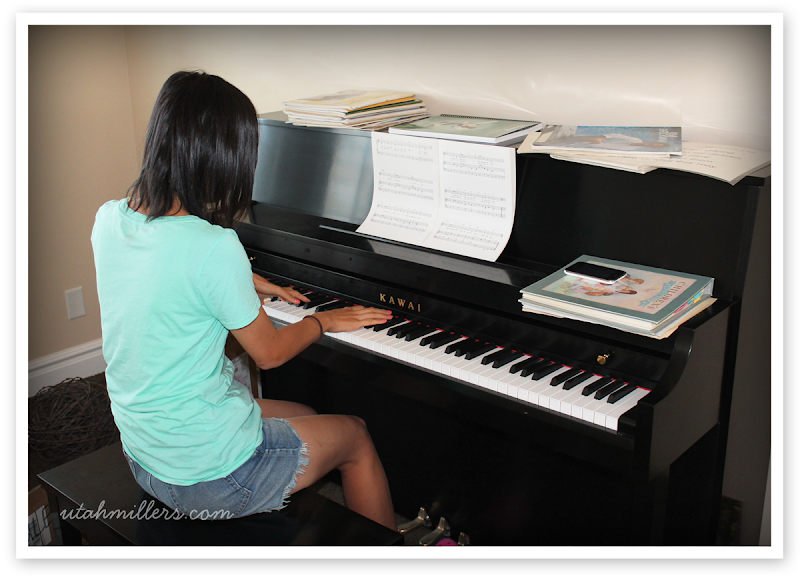 She plays the piano beautifully and we enjoyed being serenaded by her. 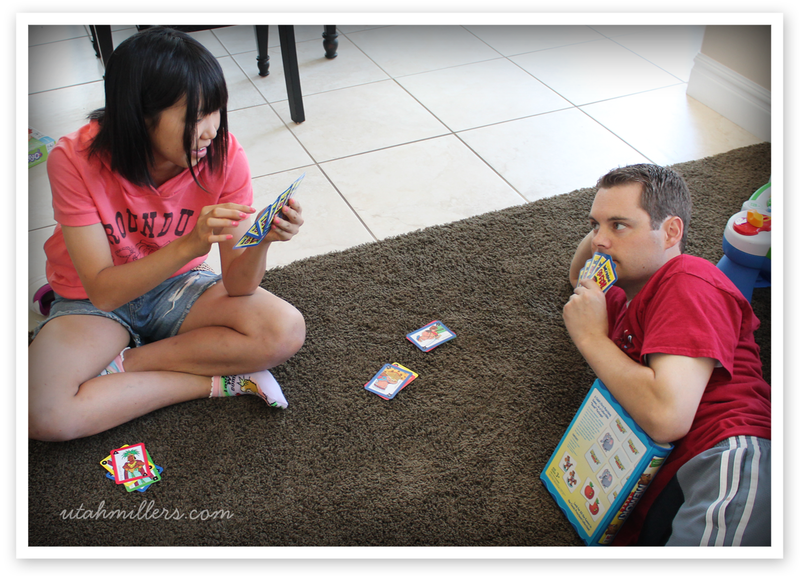 Bryson loved teaching Rina how to play all of his favorite American games. 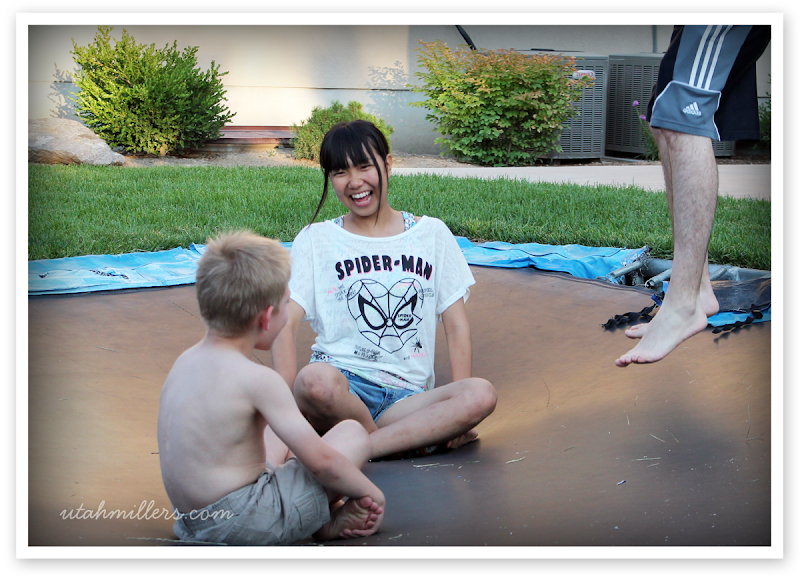 She loved learning how to play Crack the Egg on the trampoline and she and Bryson made up a cute game called "Big Buddha Ball" that they played with my big exercise ball. We also taught her how to play a bunch of American board games like Rummikub, Go Fish, Showdown Yahtzee and Memory. She completely slaughtered us in Memory. She told us she studies most of the day back in Japan and I could definitely tell her brain was a lot better at remembering things than us mentally challenged Americans! 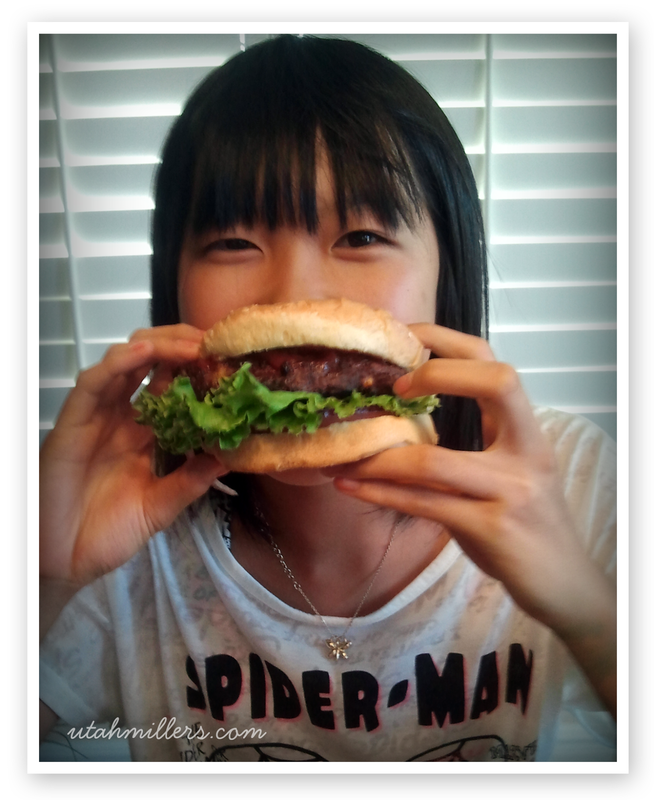 My very favorite thing about Rina is that she LOVES to eat, and boy oh boy can she eat!!! I have never seen a girl as tiny as she is eat as much as she did. She pretty much ate two plate fulls of almost every meal we fed her! It was awesome. 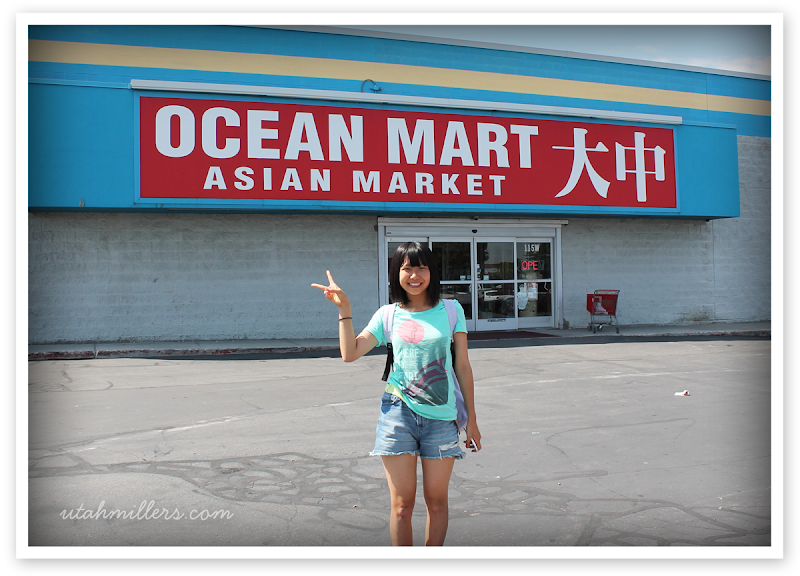 Of course we had to have a true Japanese meal while she was here, so I took Rina to an Asian market to buy the ingredients to make miso soup and tempura shrimp and cuttle fish. 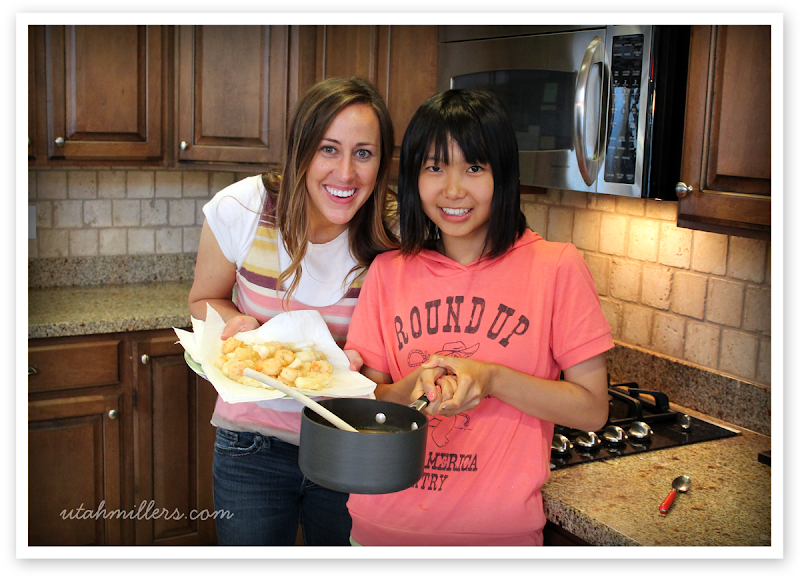 Rina is an excellent cook and I enjoyed learning from her. Mmmm....that meal right there was delicious! It was my first time ever eating cuttle fish and I have to say I rather enjoyed it! Bryson especially loved the miso soup. Rina was an angel with Bryson and Lilly and loved playing with them. She is an only child so I think she enjoyed getting to act like a big sister for a few weeks. Sadly, about a week into her stay she broke her leg! I know, CRAZY! 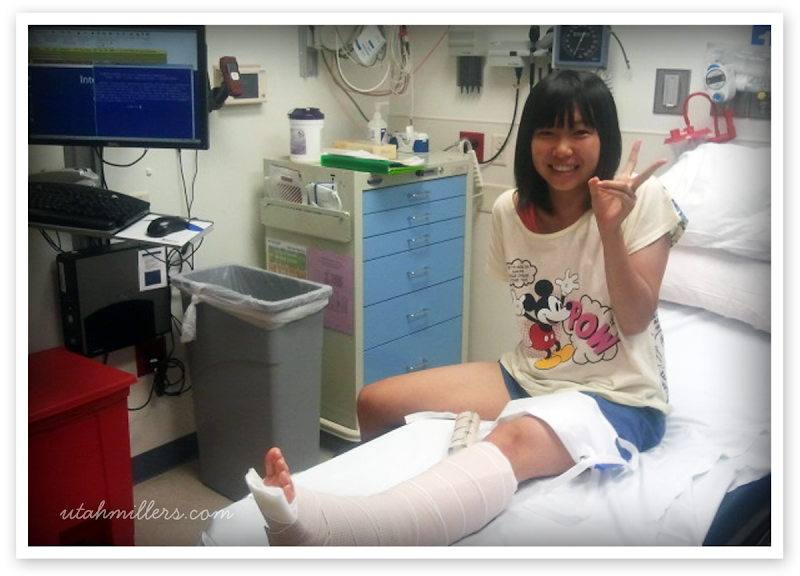 She was playing with some of my nieces and nephews in my parents backyard and somehow fell off a swing and snapped her fibula in two. So I rushed her to the ER with one of her leaders Masaki (who Rina just happens to have a crush on--oo la la!) and we spent the rest of the evening getting her leg repaired. We kept joking about how lucky she was to get to see the inside of an American hospital because that wasn't something most exchange students get to see. It was quite the adventure! 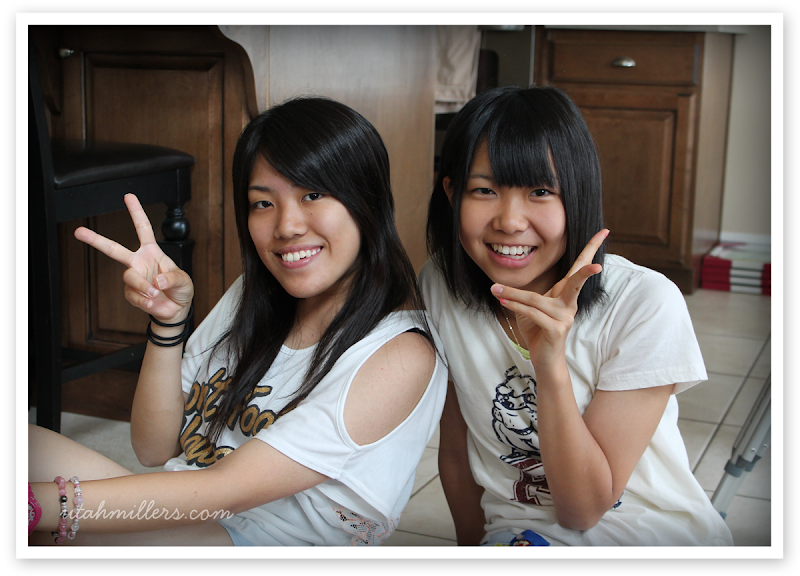 Luckily Rina's friend Satoko ended up coming to stay with us the next day. Satoko's host family had to go out of town for a week, so since we had an extra room, we invited her to stay with us as well. The timing couldn't have been more perfect and Satoko was a great help to Rina--especially with going up and down our basement stairs. The exchange students got picked up by their group leaders every morning around 8am to go and do different activities each day. They went hiking, went to a water park, went shopping, went to Temple Square and to hear the Tabernacle Choir, went to a movie, went to Cabella's, etc. 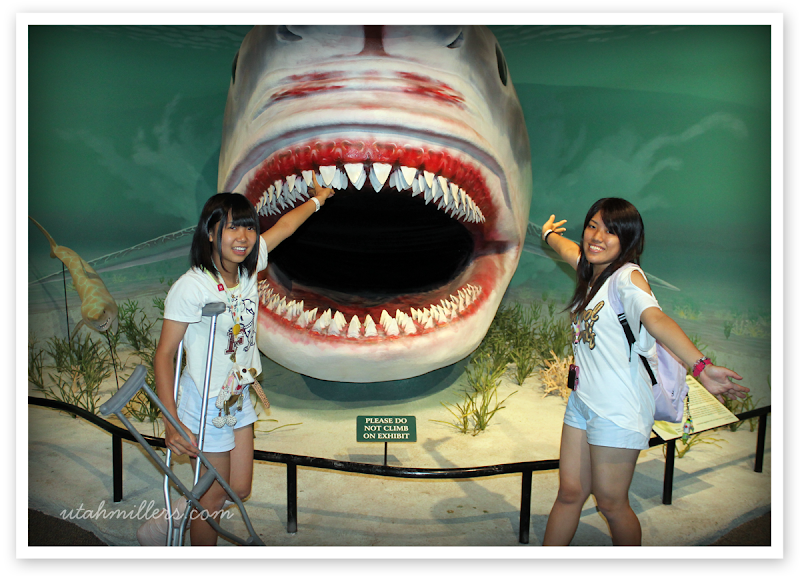 They did all sorts of fun things while they were here. They would return home around 4 or 5pm each evening and so we mostly only had the evenings with them. However, they did have two free days to spend with their host families, so the first free day we went hiking and shopping, and the second free day we went to Thanksgiving Point and shopping again. Boy do these two girls LOVE shopping...especially at Walmart. They both said that Walmart was their favorite thing about America (they don't have Walmart in Japan). 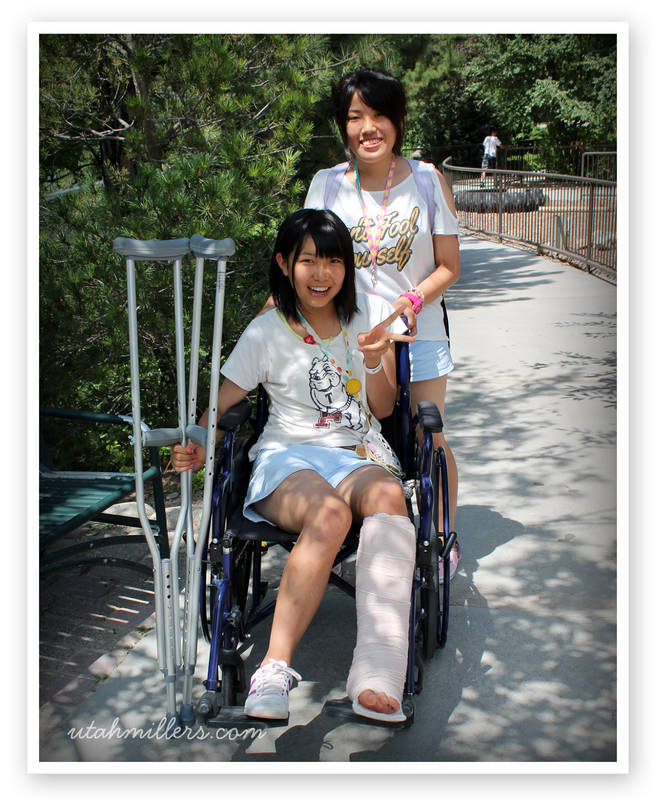 We did a lot of walking at Thanksgiving point, so luckily we were able to borrow a wheelchair for Rina and Satoko had fun pushing her around everywhere. 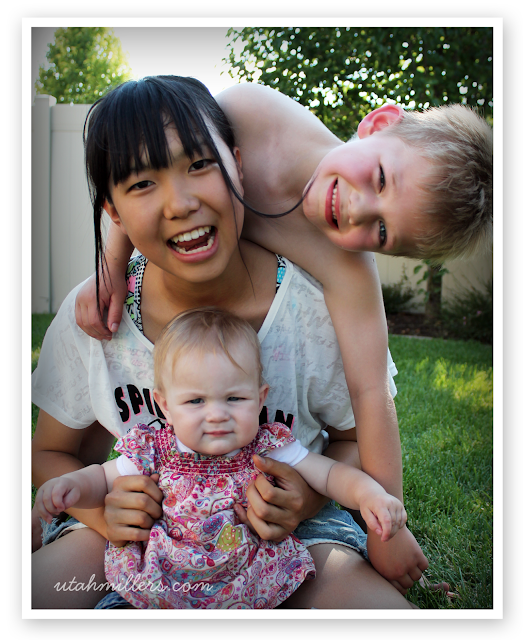 We were seriously so lucky to have Satoko around to help out. The group spent their final week on a camping trip down to Southern Utah. 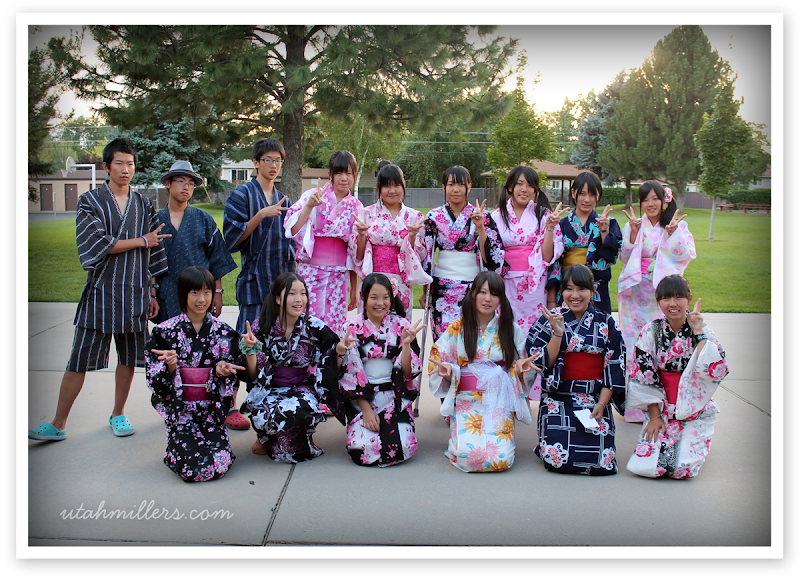 They went white water rafting, camping and hiking in Moab and then went to Tuachan in St. George to see Mary Poppins and Thoroughly Modern Millie. They had such a great time. 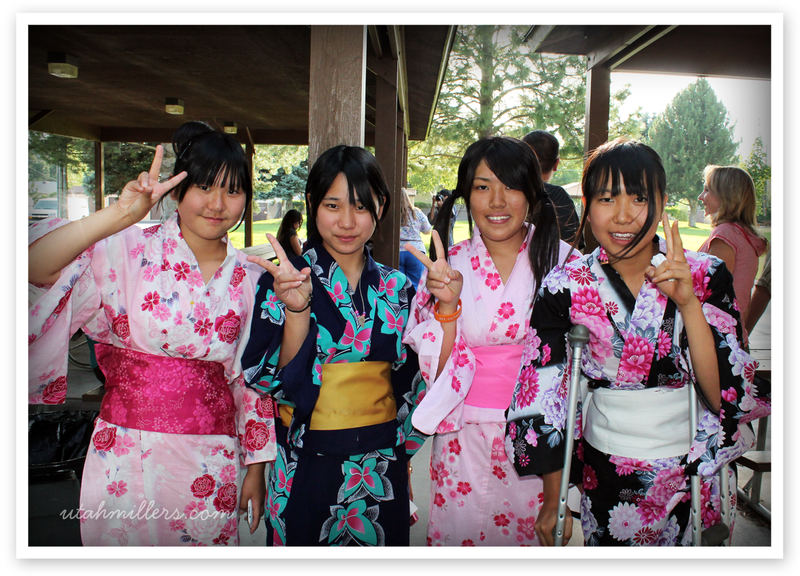 When they got back, they held a goodbye party to thank all of the host families. We had a pot luck dinner and then each student gave a short speech in English and then they sang us a song (see in video below). They all wore their traditional Japanese clothing and looked so beautiful! My cute neice Zyan really hit it off with Satoko and Rina and came to the goodbye dinner with us so she could say goodbye. Satoko was so sweet and started to cry when she gave Zyan a hug. 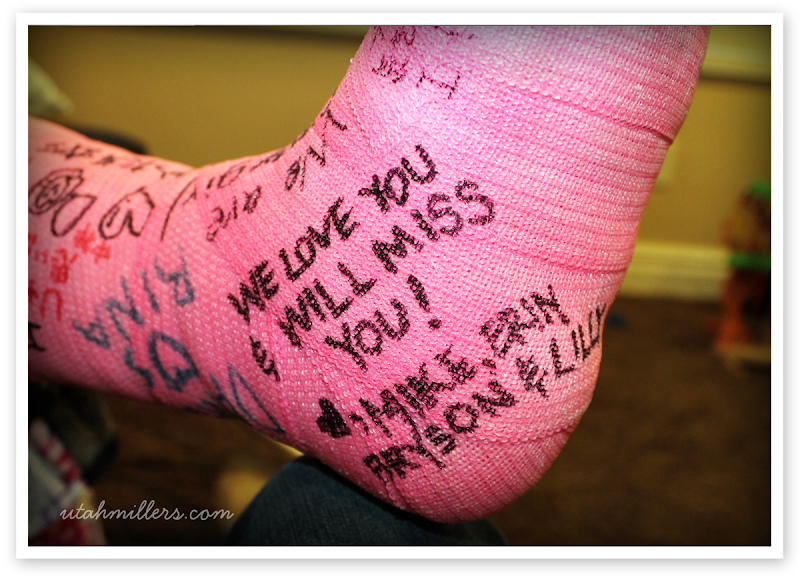 Yesterday morning Rina got her hard cast put on and this morning we took her to the airport and said goodbye. She kept telling me throughout the entire trip that she didn't want to go back to Japan but wanted to stay in Utah forever. She started to cry when she hugged me goodbye and of course that made me tear up as well. I'm glad she had such a wonderful experience here and we feel so beyond blessed to have had the chance to be her host family. It was a wonderful experience and is something we hope to be able to do again someday. Here is a video I made of Rina last night after the goodbye party. You'll be able to see why she was so easy to fall in love with. We truly grew to love her and we will miss her so much!!! FYI: the first random monster in the video is Mike, the second is my nephew Chazz. Goodbye Rina! We'll miss you! "Life's most unexpected turns can sometimes produce the greatest joys."